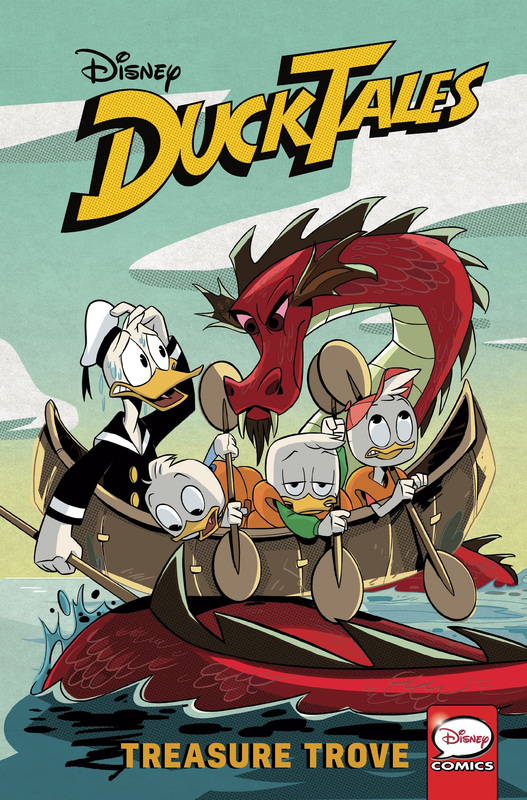 IDW Publishing, in conjunction with Disney Publishing, is bringing Scrooge McDuck and his young triplet great-nephews Huey, Dewey, Louie, plus Webby, back in a cleverly written, comic book series to coincide with Disney XD’s new animated comedy adventure series “DuckTales” debuting Saturday, September 23 with two new back-to-back episodes (7:00 a.m., 11:00 a.m., 2:00 p.m., 5:00 p.m., 8:00 p.m., 10:30 p.m., EDT). DuckTales: Treasure Trove collects issues #1 and #2, as well as the special introductory issue #0 from IDW’s ongoing series, set prior to the series opener. In fact, today marks the 30th Anniversary of the television debut of “DuckTales”! DuckTales: Treasure Trove is told from the vantage point of Scrooge McDuck’s young companions as they prepare to meet their wealthy great-uncle for the first time. Written by Eisner-Award nominated comic book creator Joe Caramagna and illustrated by a passel of Italy’s finest Disney artists, this title is set to bring you a mix of vibrant new Duckburg short stories set in the world of the animated series.